Although they could not take any actions, at their regular meeting tonight the Elk Grove City Council heard comments from 24 people regarding the Wilton Rancheria's proposed $400-million casino resort. The casino, which is proposed for a portion of the parcel currently occupied by the unfinished Outlet Collection at Elk Grove shopping center, has become something of a lightning rod for controversy in Elk Grove. In addition to a mailer send by an anti-casino group calling itself Protect Elk Grove, many of the 24 people testifying this evening said they also received so-called robo-calls urging people to attend the meeting to oppose the proposed facility. Before the commencement of public comment on non-agenda items, Mayor Gary Davis said that the Wilton Rancheria had asked to give a presentation to the council. However, the tribe withdrew the request upon learning the Councilman Pat Hume would not be in attendance. Typical of the five people who spoke against the casino was Elk Grove resident Larry Castle. A retired law enforcement with 29 years of experience in Stockton, Calif, Castles said casinos offer benefits to the community such as employment opportunities. "The casino is a good thing, not a bad thing," Castles said. "The pluses outweigh the minuses." The 19 people who opposed the casino expressed a wide range of concerns ranging from increased traffic, diminished property values to more crime including prostitution and drunk driving. Several also noted the negative economic effects it has on families. "I can see first hand what can happen - prostitution, theft, and in one case, murder," said Elk Grove resident and retired law enforcement professional Jan Gosset said. "Most of the people who are there can't afford to be there. There is nothing positive that comes from gambling." Another speaker said the City's unfulfilled projects like the aquatics center and soccer stadium had created a backdrop of desperation. "There's almost seems to be a sense of desperation to get Elk Grove on the map," Elk Grove resident Susan Mason said. "A lot of us don't want that. A lot of us want Elk Grove to remain the way it is." Since the item was not on the agenda, the city council only received the comments and could not take any action. No date was provided as to when the Wilton Rancheria would make a presentation to the council. Who is Protect Elk Grove? Before tonight's meeting Protect Elk Grove implied in a text message to EGN that more information regarding their identity would be revealed. 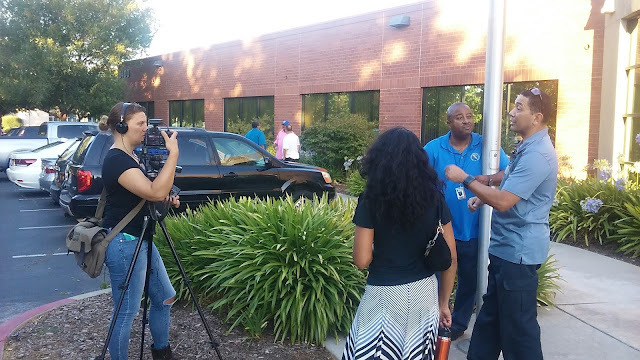 After last week's information session held by the Wilton Rancheria, Protect Elk Grove posted a video on their site of an Elk Grove resident speaking against the proposed casino. After tonight's session, a non-TV news videographer was recording interviews outside the council chambers. The same person was recording the speakers during public comment. EGN was unable to obtain the individual's name who was shooting the videos or if she was affiliated with Protect Elk Grove. Unbeknownst to the videographer, one person who agreed to be interviewed spoke in favor of the casino during public comment. While conducting what appeared to be a video interview, the camera's lens was pointed away from the subject. (See image below; click to enlarge to see viewfinder pointed away from the subject). Audio of the public comments during the non-agenda items is posted below.